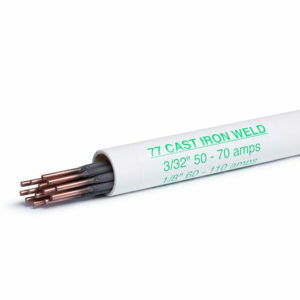 Below is a customer testimonial for http://www.MuggyWeld.com 77 arc welding electrode. Since writing to you via your website, I now found your email address enabling me to attach photos of our first cast iron repair with your 77 rod. It was amazing how nicely the 77 flowed with no splattering and popping as experienced in prior cast iron welding repairs. We did not take time to go for a real pretty weld, being more concerned with getting a good, deep penetration weld for maximum strength on this cast iron mounting bracket for the heavy sanding head on a Craftsman 6×48 belt sander in which this part was no longer available, thus rendering it useless until along comes Muggy Weld 77!!! Now we will have a much used, valuable shop tool available for regular use.